Speak with our materials and freight consultant. It feels good to save money on your shipping products. Until your shipping products fail and you have a ginormous mess on your hands. And before you know it, you’ve lost time and money. Face it; wimpy containers don’t cut it. 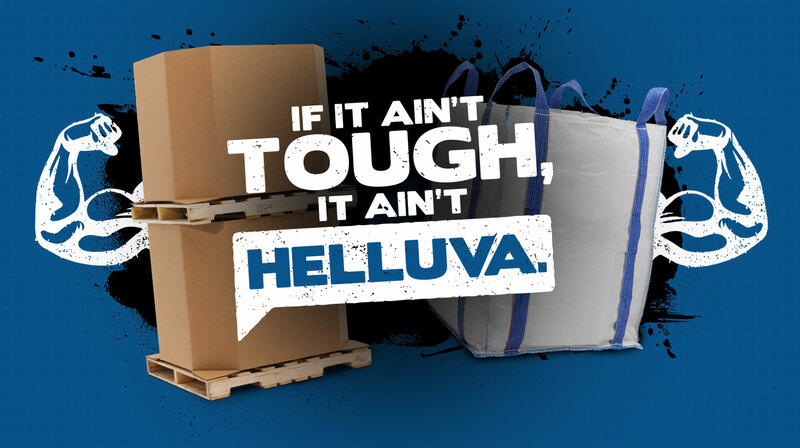 Precisely why you should ask for Gaylord boxes, FIBC bulk bags, liners, tape, film and pallets from Helluva. When handled properly, they can withstand their fair share of abuse. After all, when you put stuff in a container, you expect that stuff to stay there until you decide it should come out. Not the other way around. So insist on the toughest boxes and bags around. Insist on Helluva. It’s the difference between buying for performance versus buying for price. Each Gaylord box is a bona fide corrugated fortress. New or used, they’re tough as nails. Tougher, actually. Our bags hold up to the hype – and anything else you decide to throw their way. Don’t settle for less. Our regional warehouses throughout the US provide quicker delivery times and lower delivery rates.